José Pedro Costigliolo studied at the Circulo de Bellas Artes in Montevideo (1921-1925) and painted in a synthetic style until 1927, when he began a career as a graphic designer and pursued it with great success for about a decade on both sides of the Rio de La Plata. He returned to painting in 1946 inspired by his discovery of derivatives of Cubism such as the Purism of Amédée Ozenfant and Le Corbusier and the Cubo-Futurist synthesis of Emilio Pettoruti. He made Naturalezas muertas from flat forms and uniform colors, and abstractions of human figures. For Costigliolo, retaining the vestiges of figures corresponded to the correct definition of abstract art and what truly made it different from non-figurative art. He painted his “Abstractions,” until 1950. Later, Costigliolo entered his “Structures” stage, wherein he moved away entirely from representation (1950-1953). 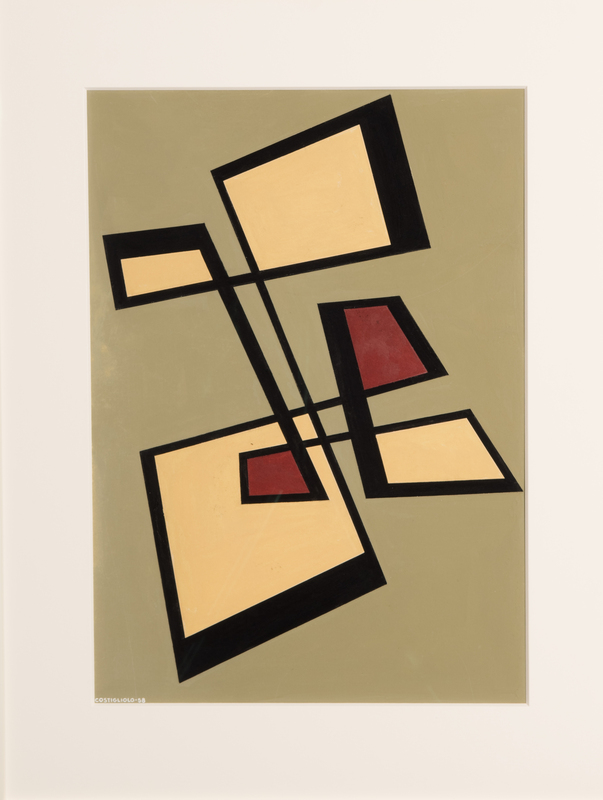 His compositions of this time, made with oil, lacquer, gouache and the media proper to graphic arts, were geometric, with use of strong orthogonals and calculated chromatically variation. In 1952, he founded, with his wife Maria Freire, the group Arte No Figurativo, which was aesthetically compatible with other Argentine and Brazilian contemporary groups but without their political positioning and belligerent attitudes. He participated in the two exhibitions organized by the group at the Asociación Cristiana de Jóvenes (Montevideo, 1952 and 1953). In 1954, Costigliolo participated with Maria Freire and Antonio Llorens in an exhibition at the Galeria Salamanca that marked his separation from the group Arte No Figurativo. At this time he perfected his technique, using geometric elements with greater freedom, creating contrast between the lines and the thick forms, and using more intense and varied colors. Between 1957 and 1960, he traveled to Europe with Maria Freire, where he specialized in the medium of stained glass and established ties with avant-garde artists. Around 1960 he explored Informalism, but soon rejected the Informalist works he had created and destroyed almost all of them. Between 1961 and 1963, he developed an interest in typography and made compositions from combinations of Latin, Hebrew or Chinese characters, without any apparent order but with all executed with impeccable technique. Costigliolo in 1965, returned to geometry and used exclusively square, rectangular and triangular forms that gave name to many of the series he produced until 1984. The square format and the acrylic paint became constants in his work. However, two moments can be distinguished in this long period. First, the geometric elements, organized by chromatic affinity, seemed to move slowly and perpetually in a viscous realm. Later, the works acquired a dynamic character and become vertiginous and almost frenetic, with groups of shapes threatening or fighting among themselves, and the color black, used in the past as background or outline, took on an active and almost violent presence. In 1970, Costigliolo received the Gran Premio de Pintura of the Salón Nacional, and in 1981 he was awarded the Gran Premio de Pintura at the 1st Bienal de Primavera (Salto, Uruguay). After 1978, his production was limited due to his suffering from Parkinson’s disease.